What does ARINC 604 stand for? ARINC 604 stands for "Guidance For Design And Use Of built-In Test Equipment"
How to abbreviate "Guidance For Design And Use Of built-In Test Equipment"? What is the meaning of ARINC 604 abbreviation? 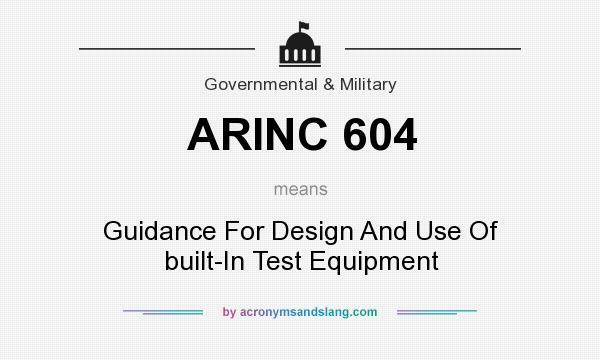 The meaning of ARINC 604 abbreviation is "Guidance For Design And Use Of built-In Test Equipment"
What does ARINC 604 mean? ARINC 604 as abbreviation means "Guidance For Design And Use Of built-In Test Equipment"